Frangible bullets play a vital role in training. The frangible bullet at left was struck with a hammer to show the its brittleness. When fired on steel targets, a frangible turns to dust (c.), but in water jugs it acts like an FMJ (r.). Frangible bullets are brittle bullets, designed to break up on a hard surface. Typically they are "sintered" bullets, usually copper or copper alloy. Sintering is a manufacturing process where you use powdered metal and press it into a shape to form objects. The shapes can then be further treated to make them more solid, dense or tougher. Typically, the extra work involves heat treatment or hydraulic compression in a mold. The heat or pressure (sometimes both) makes the part harder and denser. When it comes to bullets, the additional heat and pressure are skipped or used very lightly. The idea is to create a bullet tough enough to withstand the forces of loading and feeding but one so fragile that when it strikes a solid object it disintegrates, going back to its powdered state. Why do this? Bounce-backs and lead exposure. The generally accepted safe distance at which you can shoot a steel plate with lead or jacketed bullets is 10 yards. That's with a properly designed, hard steel plate, in good repair. If you let your cousin Bubba shoot your plates with his .30-30 or slugs, the dents (known in the biz as "craters") will deflect broken bullet parts right back at you. That's why many ranges get very upset when someone shoots their plates with rifles. Rifle steel is much more expensive, and even so the minimum safe distance for them is 50 to 75 yards. Many rifle instructors won't let you shoot on steel inside of 100 yards. Also, a lot of ranges are indoors now, and the outdoor range facilities that function as simulators--built to look like houses, etc.--are enclosed. Unless you live in a McMansion, you won't find many dwellings here in the U.S. that have 10 yards in any direction. And since correct training for indoor uses has to reflect indoor distances, if you are going to build or use a simulator, you have to have engagement distances of a few feet in some instances. An operation such as Gunsite, with the Funhouse and other simulators, sees a lot of use. If we assume 20 students a class and 20 classes a year, with each student doing the Funhouse twice, that means each target plate will take no fewer than 1,600 hits. With traditional bullets, that's a lot of lead, a lot of bounce-back chances and a lot of lead dust. Change the bullets to frangibles, and those 1,600 impacts all disintegrate on impact, and there is no lead exposure to the students and instructors. Now, this is not a win/win situation. There are good reasons lead has been the primary bullet material for centuries. Basically, it comes down to density and durability. For the same caliber and shape, a frangible bullet will weigh less than that of a similar lead or jacketed bullet. The example I have in front of me, a Speer/LE .40 caliber, weighs only 125 grains--despite being the the same size as a jacketed 180-grain .40 S&W bullet. 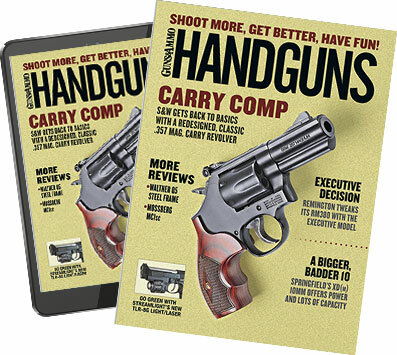 The lighter weight complicates loading data, as the loaded round has to feed and function properly in a pistol designed to shoot 180-grain bullets. The weight difference also can change point of impact. However, that isn't as big a problem, since we're planning on using these puppies at two to 10 feet anyway, and the disparity in point of impact, at 10 feet, is almost unmeasurable. The accuracy of frangibles can also be less, but again, we're shooting at targets across a large room. Durability is also a problem. It is not easy making bullets that will withstand feeding (and the battering they take in the magazine during recoil) that will also break up on impact. It is not unusual for frangibles to give occasional feeding problems, or even break up before, or on the way into, the chamber. That can cause a real malfunction. As a test, I took a loaded round and gave it a tap with a hammer, right at the case neck. Ooops, busted bullet. If you drop a loaded frangible onto a hard surface, expect it to be damaged, and dispose of it properly. Me, I look at dodgy feeding as more training. Your handgun just choked on you? Well, do something about it. But some shooters take it personally. "Hey, I paid good money for this ammo, I expect it to be as good as the regular ammo I'm using." Well, it isn't, so get over it. Extreme Shock manages to avoid a number of these problems. First, the company uses a mix that is denser than the usual copper or copper/tin powder. Second, it sinters the core into a thin jacket. The jacket acts to keep the sintered core together during feeding but does nothing to hold it together once it hits the steel. However, Extreme Shock, along with everyone else, cannot escape the inevitable economic constraints on frangibles: They cost more. They cost more because there are fewer made and because labor costs are higher. And you're paying more for ammo that has a narrow application. If you think this is perfect close-quarters defensive ammo, think again. You have to use them properly. On hard surfaces, frangibles break apart. That breakage makes them relatively safe even at very close distances. On anything else, they act like full-metal-jacket bullets. \In ballistic gelatin, a frangible bullet is more likely to hold together like an FMJ--and keep on penetrating--than break up. Sometimes they'll crumble and break into a few pieces, but they don't disintegrate. Ditto wallboard, wood and other obstacles found in buildings and on the street. Yes, they'll break apart on vehicles, but if the bad guy is hiding behind the thinnest of sheet metal, do you really want a bullet that will turn to powder? No, this is training ammo, not the administrator's answer to poor marksmanship. As a test and demo, I shot the Speer frangible (all of them will perform similarly) and a jacketed hollowpoint into water jugs. The result? As expected, the hollowpoint expanded in a bit over two feet of water. The frangible bullet penetrated nearly four feet and held together. In short, frangibles are good at what they do. So use them right, use them smart, and use them only when you need them.